Just seen the replies post the clock completion, thanks again for the support guys, much appreciated. Don, did Authur C Clarke really say that? Jim, I'm happy to share my stuff, no worries. I'll ping you a mail. Let's work it. As for my location, I'm in Madrid for the next 3 years, the move from the uk went well. Your work belongs in museums...seriously well done. Clark actually wrote, "Any sufficiently advanced technology is indistinguishable from magic," which I paraphrased because your work seems to fit the description so well. To someone like me, your work - although it may be the result of talent, patience, knowledge, and skill - is truly magic. 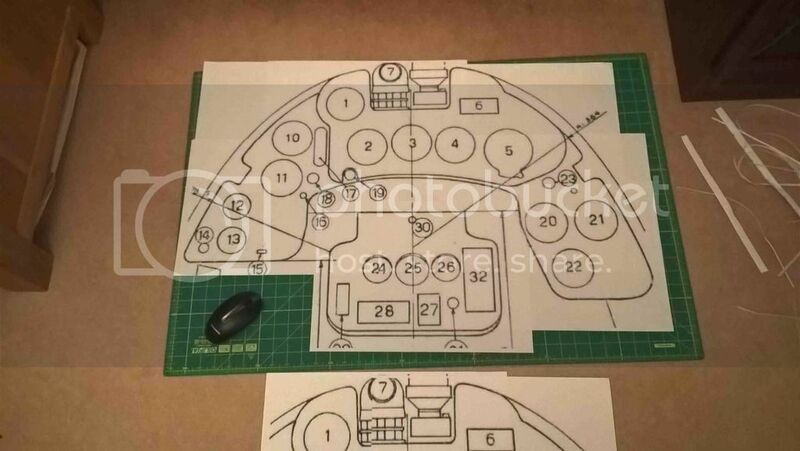 In my last project I used picture framing card for the instrument panel. I found that although it was easy to cut and shape it was very flexible and required lots of supports to strengthen it. With this project I'm going to try Cardboard. The cardboard is much harder than the previous card and the easiest way to cut it out is with a jigsaw. Next step, the gauge cut outs. Yep, another master piece in the making. Any musea already interested ??? Ive started work on the main part of the panel, the centre section. The cardboard is very strong yet easy to cut out and sand/shape. this is cheating!. . . a few of us know that the 'Folgore' flew with the DB-601, so same panel as bf-109, yes?? obviously i am teasing you. . .this is great! please keep posting. For a minute there I almost believed you, ha. How simple that would have been. Talking about similarities. The magnito selector lever is the same in both aircraft and that's about it(the engine is also the same but an Italian licience built copy). An interesting item in the cockpit of these aircraft is the fuel gauge. It's not what you would expect, in fact, here's a little challenge for you cbg, and to anyone else who is interested. Find the fuel gauge for these aircraft.